We are creators as we are Divine Children. When we co-create with the Divine in us we help bring Heaven to Earth. Engage yourCchild within in the joy of creating, and you will be a Peacemaker and Healer of the Earth. Recently I have been learning about Crystals. There are many new books out with great information on healing with Crystals, making gem elixirs and simple ways to use Crystals to enhance your Life. I’ve learned that one of their qualities is to radiate frequencies of Light. I’m learning from these books, which I’ve found very inspiring and helpful, in addition to my intuition as I’ve used Crystals for 30 years in my intuitive practice. Crystals are truly magical. I hope you will treat yourself to one or a few. Crystals for Healing: The Complete Reference Guide by Karen Frazier. This is an extensive and detailed guide, though it is very simple to use. The photographs are excellent. It is organized in easy to follow parts: basics, shopping, preparing, remedies for mind, heart and soul, and the super helpful Crystal profiles. She lists in her reference section The Crystal Bible, by Judy Hall, which is another favorite of mine. Gem Water: How to Prepare and Use More than 130 Crystal Waters for Therapeutic Treatments, by Michael Gienger and Joachim Goebel. This little book is packed with great information and how to precisely make these waters at home. They are both Crystal gem water Healers with experience in research and practice. Also really good photos of 105 specimens. Enjoy. Healing with Gemstones, by Pamela Louise Chase and Jonathan Pawlik, rounds out the basics in a very spiritual, insightful way. They talk to the overlighting Devas of the gems and receive detailed channeled information on the Healing properties of the Crystals. For example:,The Pink Tourmaline Deva says: “I teach you that Unconditional Love cannot be possessed or manipulated. My energies help you to clear your attachment about how love ‘should’ be expressed in an experience when your expectations become too high or too fixed, and the object of your devotion deviates from those expectations, I challenge you to let go of your expectations. I can also help you remain in a state of balance by teaching you to enjoy the flow of your life, wherever it takes you.” This book doesn’t contain any photos but is rich in Spiritual insight. The photo above is of a mandala I created today for you. Each of the Crystals radiates specific frequencies of Love-Light for You. 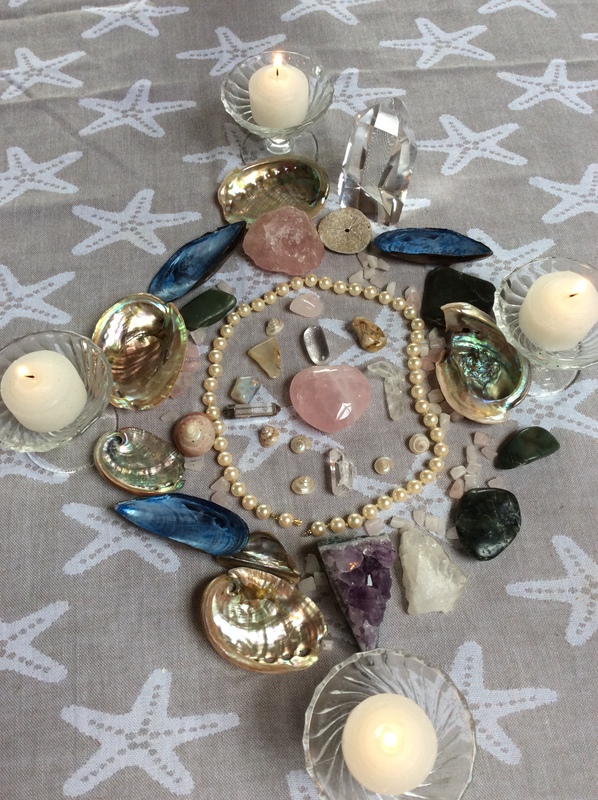 Rose quartz for Divine Love, pure quartz crystal to transmit Light and purity, Big Sur Jade for good luck and Peace, agate for Peace and calm, many sea shells for the many varied Gifts from the sea, pearls for your wisdom and amethyst for your spiritual clarity. Enjoy. The Light has no boundaries, just like sunlight. Another fun thing to do with Crystals is to create a gratitude ceremony for Grandmother Earth and Mother Nature. Take any Crystal that you are not using and joyfully give it back to the Earth in thanks. Bury it near your favorite tree or any spot that you feel is right. The Earth loves her Crystals and generously gives them to us and is happy when we use and appreciate them. If they are just tossed in a drawer and not really used you will reap the benefits of generosity by giving them back. Please note the disclaimer here.